Bhai Gurcharan Singh Ragi, the doyen of Gurbani Kirtan and a living legend, is the11th generation exponent of this precious heritage. He started training at an early age under his illustrious father, Bhai Sahib Bhai Jwala Singh, who besides acquiring the musical heritage from his father Bhai Deva Singh, gained further training from two famous ragis of the nineteenth century, Bhai Sarda Singh and Bhai Vasava Singh, also reverently called Baba Rangi Ram. Baba Vasava Singh also taught non-Gurbani dhurpade to his father including original masterpieces composed by several maestros such as Nayaks of Khandar-bani, Swami Haridas, Mian Tansen and these were passed down to him and his younger brother. Apart from rigorous swar-sadhana and correct rendition of most intricate shabad reets (old compositions – kritis), Bhai Gurcharan Singh, also was a master percussionist having studied from the legendary Ustad Bhai Arjan Singh ‘Tarangar’. Bhai Gurcharan also studied from the legendary vocalists Ustad Batan Singh of Mehli (Kapurthala) and Bhai Dal Singh of Lasada who were very close friends of his illustrious father. Bhai Gurcharan Singh belongs to a rare category of ragis of the Sikh tradition who are fully conversant and apt in singing all the ragas, lores and variants of the music such as chant, varaan, padtal and dhurpade contained in the Gurubani, first compiled by the fifth Sikh Guru, Arjan Dev, in AD 1604. He is affiliated with three taksals or sampradas namely Amritsar, Sekhwan and Girwadi and has received immense recognition from across the globe. He has been conferred many awards including the Shiromani Ragi Award for the year 2007-08 by the Punjab Government, the Shiromani Sahitkar Award by Punjab Languages Department and is a Senior Fellow of the Punjabi University, Patiala. He has lived in Delhi since 1952 and, along with his brother Bhai Avtar Singh Ragi, served as the Head Ragi at Gurdwara Sisganj Sahib for 38 years. Bhai Gurcharan Singh and his younger brother, Bhai Avtar Singh Ragi (d. 2006), made one of the most important contributions to the world of musicology when they painstakingly put together 497 notations of the original shabad-reets dating back to the times of the Gurus. 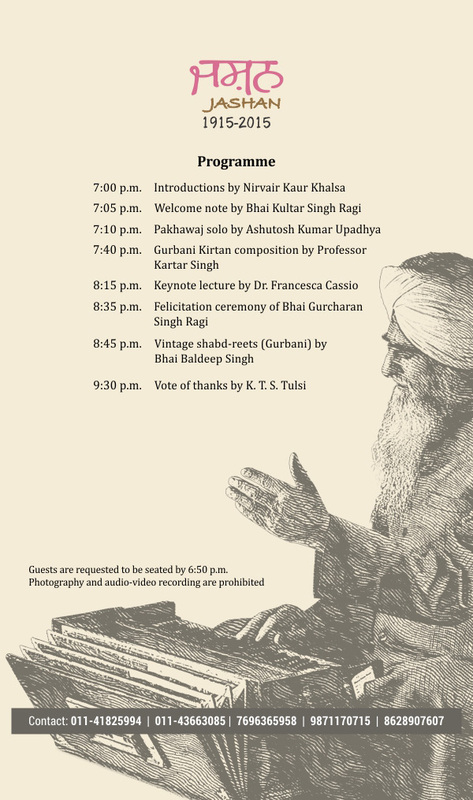 This path breaking research was eventually brought out by the Punjabi University in two volumes titled Gurbani Sangeet: Pracheen Reet Ratnavali (1977) and has since acquired a near iconic status and bears eloquent testimony to the musical genius of the great Gurus. Bhai Gurcharan Singh also continues to write and has 10 books to his credit. In continuation of his earlier work, he zealously devoted himself to further compile notations of another 200 compositions, which had remained undocumented. By April 2008, he had finished deciphering the notations of 215 compositions in 50 ragas at the ripe age of 94. The Guru Nanak Dev University, Amritsar, in collaboration with the Anād Foundation, New Delhi, is in the process of publishing this seminal work, edited by his grandnephew, Bhai Baldeep Singh. For his resolute contribution to the fields of Gurbani Sangeet and Indian classical music, Bhai Gurcharan Singh was conferred with the coveted Tagore Ratna Fellowship by the National Sangeet Natak Akademi in the year 2013.